Axios means deserving...and you deserve the best! Come in and relax your body, mind, and spirit at Axios Salon in Lake Grove, NY. After a week of rushing around, chasing kids and meeting deadlines at work, you deserve some pampering. All of our professionals are here to help you rejuvenate by providing you with friendly, personal services in a warm and inviting atmosphere. You can choose from a variety of services which include hair coloring, straightening or a new hair style. Here at Axios Salon, we use only the best professional products for your hair. Whether it's a fresh cut or a new style, Axios Salon has got you covered. Call for an appointment today, and see what our talented hair stylists can do for you! 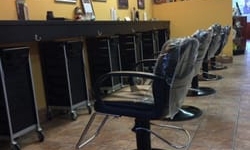 At Axios Salon we want you to feel special, confident and relaxed, knowing that your make-up will be flawless and just as you envisioned it to be.